[By Nick] National Ice Cream Month might be over but I'm going to give you a reason to eat more ice cream sundaes if you live in my area. I've partnered up with the awesome folks over at the Ben & Jerry's in Saratoga Springs to raise money for a local charity. For the month of August, a portion of their proceeds from sundae sales will be going to Shelters of Saratoga. 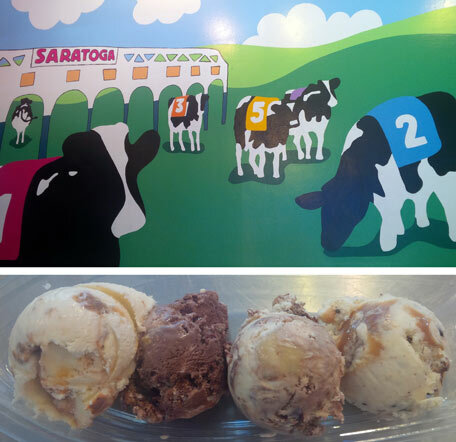 It's pretty simple, for each sundae sold, some of the proceeds will be going to help out Shelters of Saratoga. You don't have to mention it or anything (though of course I'll appreciate it if you say Nick or On Second Scoop sent you). So join #Sundaes4Shelters by heading over to 34 Phila Street in Saratoga Springs and getting your sundae fix. Not only will you be treating yourself, but you'll be doing good for others in the process. I know that not all of you will be able to participate in this but maybe it'll give you the initiative to talk with your local store to see if they can hold a fund-raiser for a charity that means something to you in your area. While working out this promotion with the Saratoga Springs shop's owner Patrick, he offered me a banana boat of some of the new/limited batch flavors he had to offer. I haven't been in a scoop shop in years and there was no way I could turn down free ice cream. ‎So from left to right we have Salted Caramel Blondie, Gilly's Catastrophic Crunch, Lazy Sunday and Turtle Cheesecake. "But wait Nick, isn't Salted Caramel Blondie and Salted Caramel Core the same thing?" Well, yes and no. While it is comprised of the same ingredients, Salted Caramel Blondie ditches the core for a swirl like I recommend in my Salted Caramel Core review. And boy was my recommendation right. This is what they should have released in pints instead of the Salted Caramel Core. With the salted caramel swirl, you're in no way getting as much of a concentrated salt onslaught. Instead the swirl works to compliment the delicious, if simple, sweet cream base. Sure, the blondies are not as big as in Rockin Blondies but they're still just as tasty. If you were like me and enjoyed everything but the core in Salted Caramel Core, get yourself over to a scoop shop for how the flavor was intended to be. Dubba has already given his thoughts on the two SNL flavors so I'll keep this short. ‎Gilly's has the problem every chocolate based flavor from Ben & Jerry's, the base is just too dominating. While I could see all the mix-ins, I couldn't taste anything besides the almonds. If you were to blindfold me, I wouldn't have guessed there was anything else to the flavor. Lazy Sunday fared way better. I couldn't really distinguish the base as a vanilla cake batter as opposed to their regular cake batter base. That said, the chocolate cupcake pieces sold me on this one. They were the textual component needed to really bring things together. If Ben & Jerry's were to ditch the original for this combo, I'd have no problem with it. Here's hoping you guys make it out to the Saratoga Springs shop in the month of August to help raise money for Shelters of Saratoga. If you get a sundae, don't hesitate to tweet us a picture of it! Heck, if you give me a heads up, maybe I'll come have one with you! If you're not in the area or just can't make it, be sure to check out some of the latest exclusives at your local store. If you decide to follow in my footsteps, report back with any information on an event your local Ben & Jerry's is having and we'll be sure to share it with the world! Dubba's Note: Well doing my editing thing, I spied the MASH-UP machine in one of Nick's photos. Basically you choose your favorite flavors, choose two toppings, and then your server will mash it up for you. How cool is that? Nick checked and this will count as part of #Sundaes4Shelters, so now you've got yet another reason to head on over to Saratoga Springs!